Today, as most Packer fans, I learned of Brett Favre's retirement. The man who has been the Green Bay Packers’ starting quarterback for all but three games of the last 16 seasons, the only quarterback an entire generation of Packers fans has known, is retiring. The Packers made the official announcement shortly before 10 a.m. today. 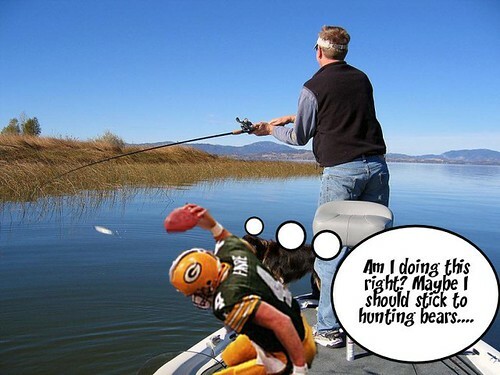 In my imagination, a retired Brett Favre would try fishing by knocking fish out with footballs. Thus, I created this image.